You are browsing the Blog for lawrence peregrines. Day 42: 3 nestlings fledged and gone! The 3 peregrine chicks have all now fledged! Now all we see is an empty nest box. The youngsters rarely if ever return to the nest box once they have fledged. From time to time, the female will perch on the nest box perch pole, if it provides her with a good vantage point to watch the fledglings. The action now is all around the Clock Tower. The nest box will mostly remain empty until the middle of next March when preparations will hopefully once again get underway for the breeding season! Day 41: last ones fledged!! Sunrise this morning was at 5:07AM. The remaining two peregrines started the day off under overcast skies, very light winds from the east and temp at 62F. The day ahead calls for overcast skies with possibility of light rain, NE winds up to 10 – 12 MPH, and temps hitting 67F by late morning, and cooling off in the afternoon. Today is looking to be a big day with number two having fledged early this morning and the last one likely to go off today. 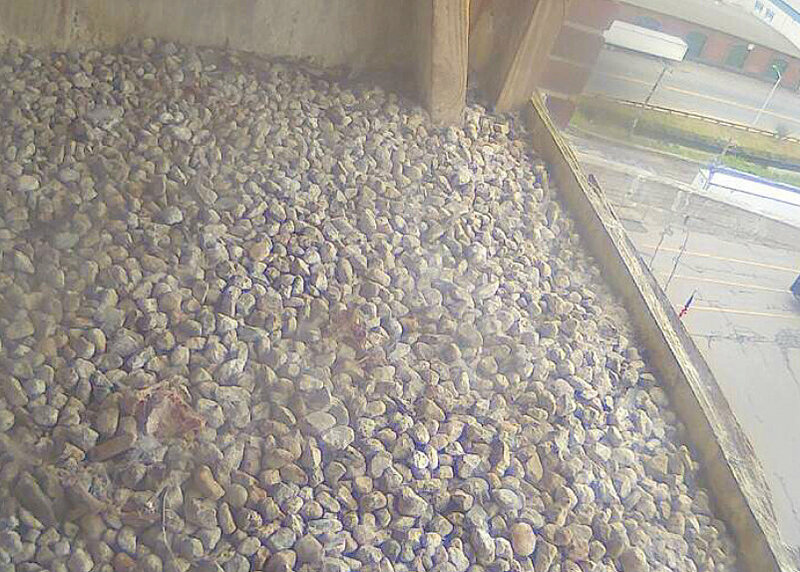 The remaining chick was seen in the nest box as late as 11AM and by 2:35PM, the nest box was empty with the last chick now fledged and out of the nest box. The web cam will continue to operate, but little chance we will see any further action through the cam. the chicks will many the next many weeks in and around the area around the Clock Tower. The chicks will be learning to fly while the parents continue to feed them. The young falcon, as it launches into the world, is a most handsome bird, and when the last vestiges of down are shed from the head, it has the regal appearance of the adult. The eyes have by now, taken on that extraordinary quality of lustrous vitality and intense watchfulness that even the best paintings cannot capture in its fullness. After sunrise at 5:07, the peregrines started this morning off under fair skies, little wind and temp at 56F. The day ahead calls for sunny skies, with a high near 76. East wind around 6 mph. The two remaining chicks continue to move around inside the nest box, with time for loafing and resting, enjoying the morning shade, wing flapping, eating, and just getting ready for the moment of first flight. The female continues to watch over the chicks, sometimes from the perch and other times from just a bit of a distance. Around 6PM tonight, checked back in and observed one chick in the nest box. It seemed to look over and just below the nest box. 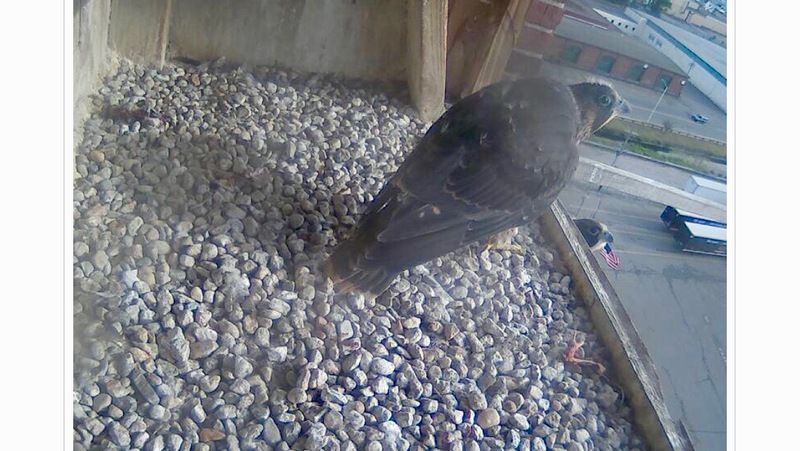 After a few minutes, a small movement was seen, and it turned out to be the other chick on the ledge right below the nest box. Ir was moving back and forth, its head just visible, and then hopped up, and back into the nest box, and remained inside. Around 7PM, checked back again, and the ready to fledge chick was seen perched out on the perch pole. It sat for a while, then hopped back inside the nest box for a while, and just after 7:20 Pm hopped back out onto the perch pole….so ready for first flight!! 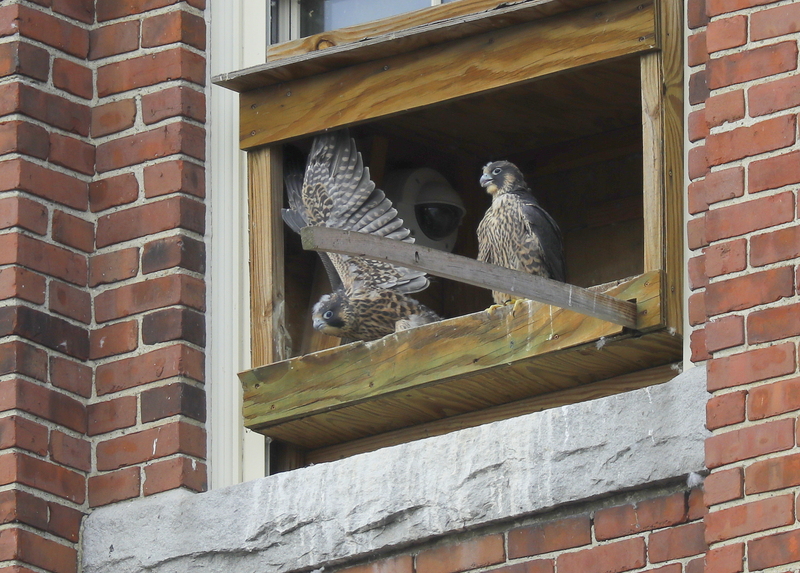 Many have asked, how do the chicks know when to fledge and make first flight? What prompts the final push to launch out into the world forms he nest box? From what researchers have observed over the years, there is likely little particular action by the parent peregrines to induce their young to fly. The adults may reduce the food rations at this time, for the young are quite fat. Generally, the chicks fly when they are ready and moved by their own instinct. The first flight can be quite strong, but when it lands on a nearby perch, it may remain for many hours. Food calls are exchanged, and the parent keeps close tabs from nearby. For a chick that has survived a fall from the nest, the adults will find, feed, and protect the chick until it is ready to fly away. Made a pass by the Ayer Mill Clock Tower this morning with a fresh determination to scour the area for the first fledgling. After first flight, there is no telling if a fledged falcon may have been injured or harmed in some way. Some times, they find a nearby spot to just rest and loaf a while. They will call to the parents for food and be cared for as long as they are in range of the nest. At times, observation of the adults, may provide clues on the location of a nearby newly fledged bird. Just before 10AM, after looking high and low around all sides of the Clock Tower, made the last stop on the north side of the Merrimack River, and scanned the entire Clock Tower and adjacent buildings for any signs of the fledgling. 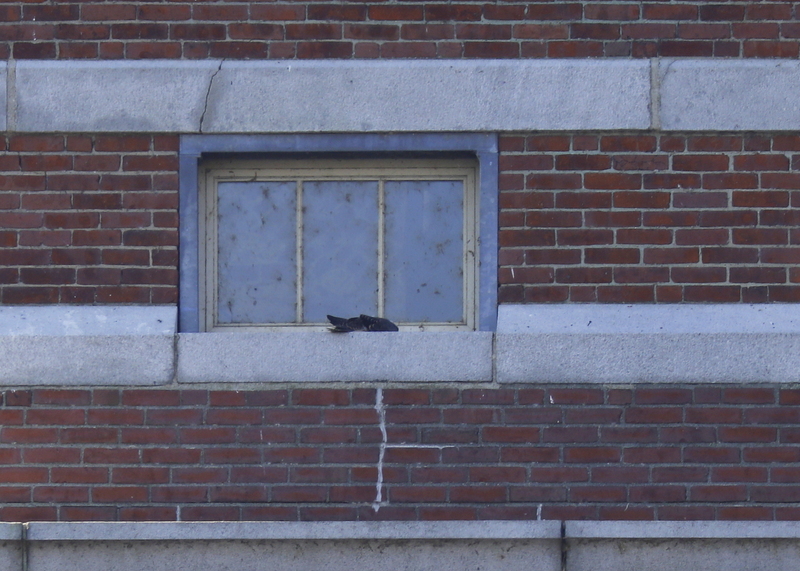 The middle window sill just below the north clock face seemed to have a dark horizontal sliver that was out of place. With binocs, it looked like it could possibly be the fledgling. A close look through the spotting scope confirmed it was the fledgling, but no signs of movement for over two minutes. Finally it bobbed its head a bit, and provided final confirmation on being alive and seemingly OK! 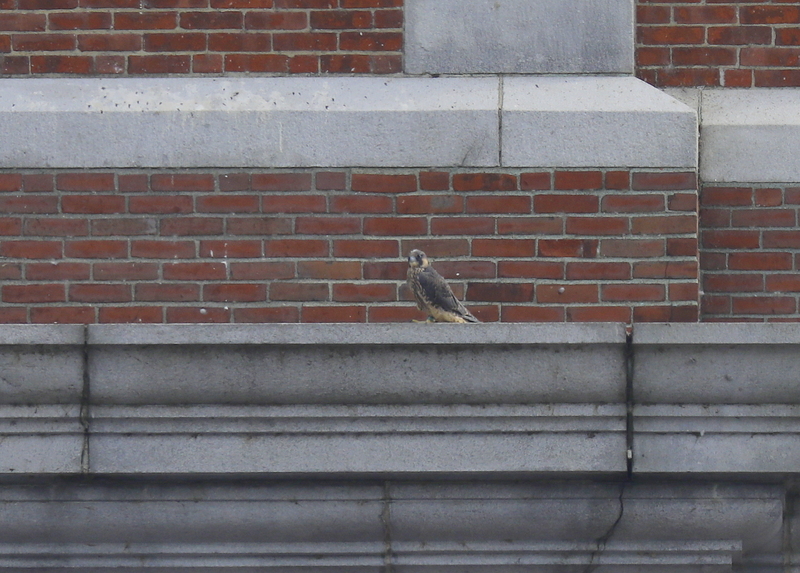 Later in the day, just after 4PM, returned to same location on north side of Merrimack River, looking south at the tower, and the same fledgling was now on a lower ledge, and perched in upright position. It likely had remained in the shade for a good part of the day, and may have moved little during the day. The female was around the corner on the nest box perch pole and the other two nestlings were seen inside the nest box. Had a chance to view the nest box from below just a bit later with nice views of one of the chicks, another in the background, and the female on the pole. 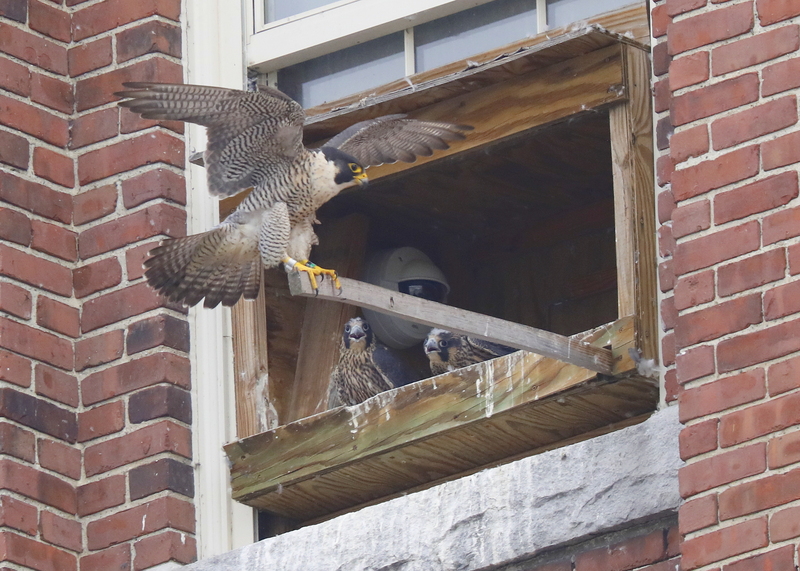 The other two chicks will likely make first flight over the next few days. Hopefully, the three chicks will remain together and nearby in the weeks ahead! Day 39: first fledge, two to go! First day of summer! Sunrise this morning was again at 5:06AM under fair skies, light winds from the south at 5MPH, and temp at 62F. 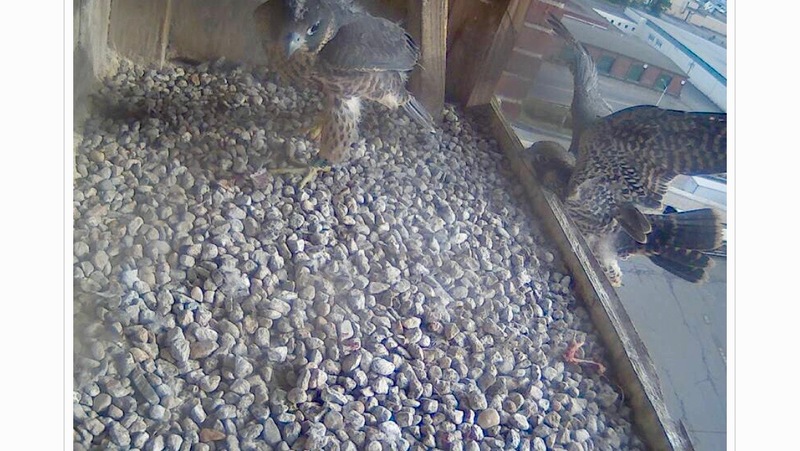 The peregrines started of this morning under fair skies, wind from south at 5MPH, and temp at 62F. The day ahead forecast calls for a slight chance of showers and thunderstorms after 2pm. Mostly sunny, with a high near 78. Light and variable wind becoming northeast 5 to 8 mph in the morning. Chance of precipitation is 20%. Now the first chick has fledged and the other two will follow shortly! 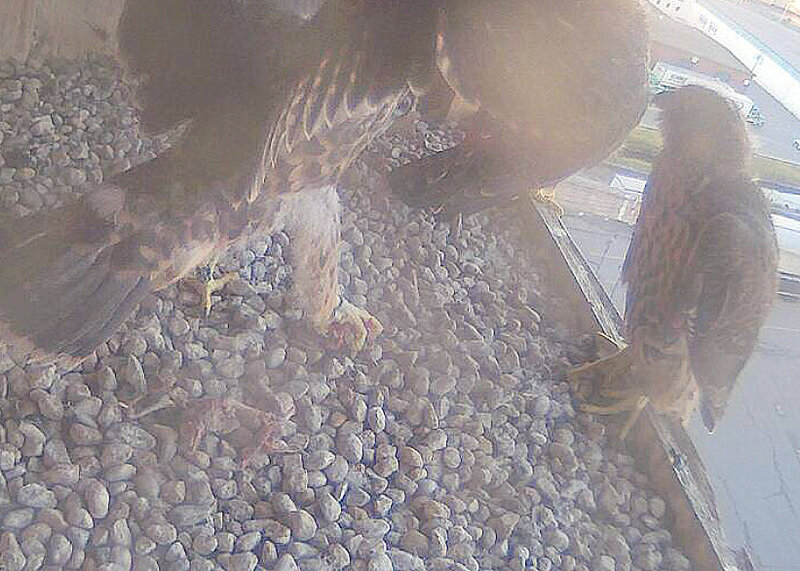 Just after 5:30AM this morning, the female dropped off prey and the two chicks went into a scrum to attack the food. The rumbled with each other over the food in a tug of war….quite a show. The remaining two continue vigorous wing flapping as they perch at the outer edge of nest box and look for their sibling nearby. First flight may happen at any time of day. The males will typically fledge first, and the females just a bit after, but not always the case. Day 38: first chick fledges! 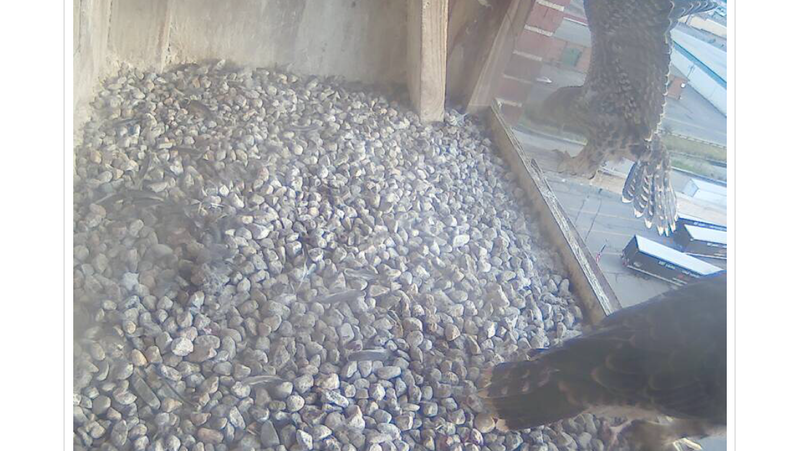 The first chick fledged some time this afternoon….right on schedule! 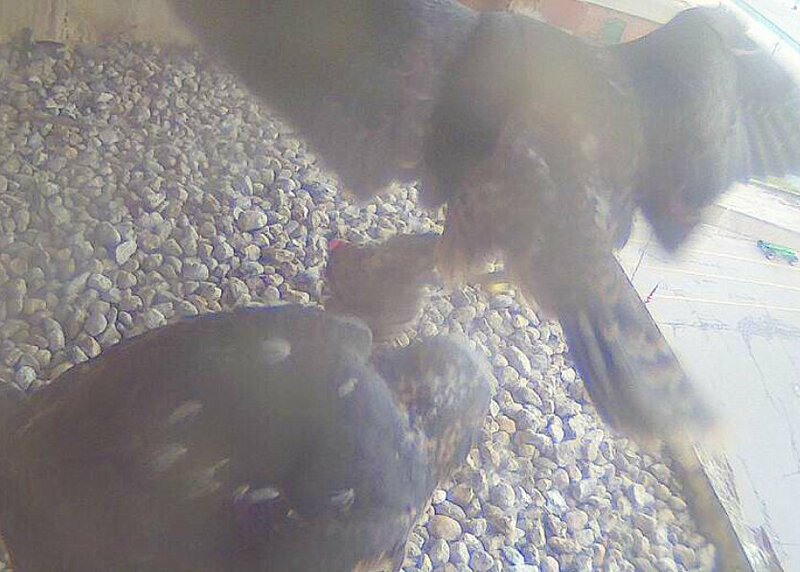 Checked in on the chicks late afternoon both through the New Balance Falcon Cam as well as outside the nest box in person. 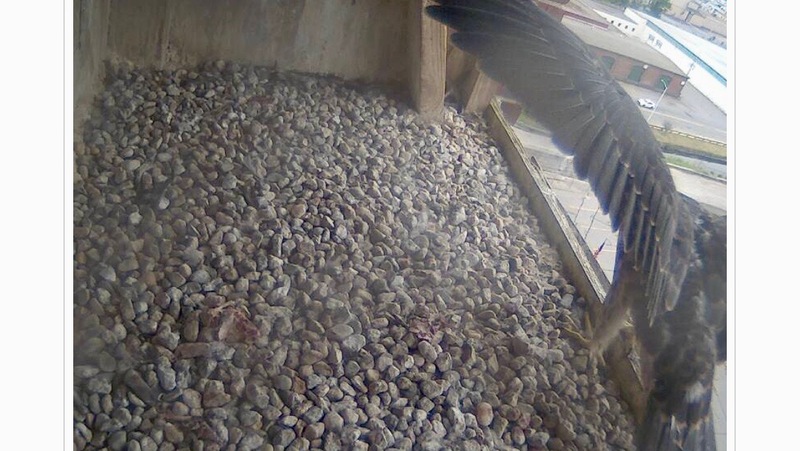 The first chick has paunched into first flight and left the nest box. This photo shows the two remaining chicks. The fledged chick was nowhere to be seen in and around the general area. They tend to stay very close at first! Sunrise this morning was again at 5:06AM. The peregrines started of this morning under clear skies, bright sun, light winds from the south at 3MPH, and temp at 57F. The forecast for the day ahead calls for mostly sunny skies, with a high near 82. calm wind becoming southwest 5 to 9 mph in the morning. Just after sunrise, the three chicks were observed hanging on the outer ledge of the nest box, gazing westward. The preen a bit, jump around, bob and turn their heads, and continue with vigorous wing flapping. Fledging, or first flight is close at hand, and they seem to know they are ready to launch into flight. 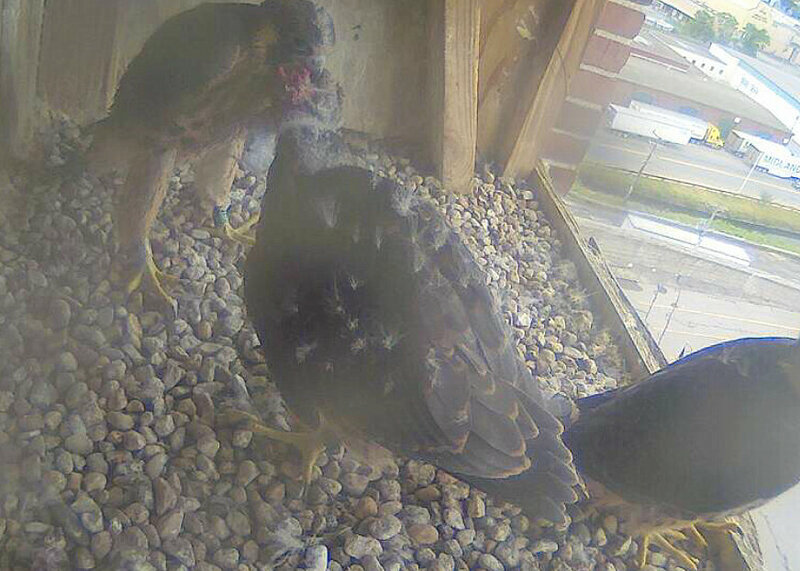 Stopped by the nest box just after 9:30 AM, and observed the female on the perch and all three chicks inside! Overall, the female chicks develop more slowly than males, and so retained their down longer. Age at first flight varies from 5 to 6 weeks. One researcher found an average of 40 days, with males flying before females. 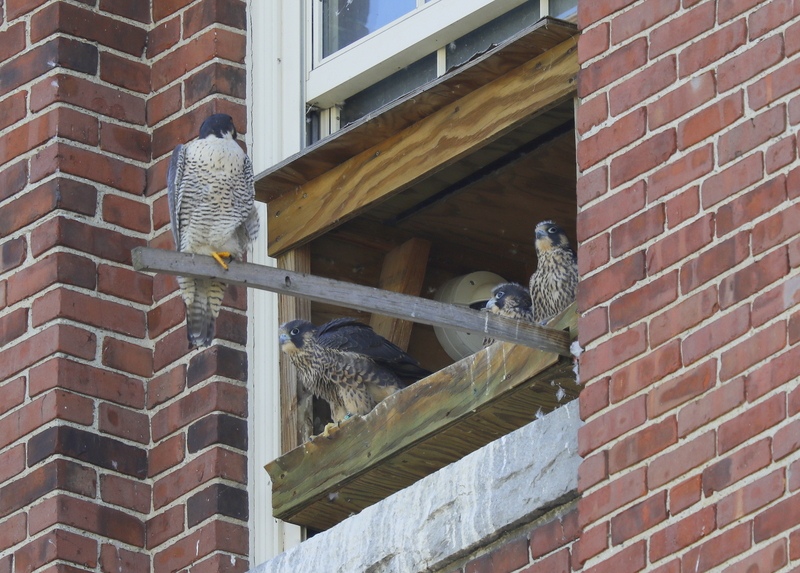 The normal range runs about roughly 38 -46 days based on some observations, with many peregrines in Eastern Mass. making first flight, on average, around 40 days. Stay tuned! Day 37: ready for flight! Today’s sunrise time was at 5:06 AM. The peregrines started the day under mostly cloudy skies, winds from NW at 9MPH with gusts up to 22MPH and the temp at 76F. The forecast for the day ahead calls for mostly cloudy skies through mid morning, then gradual clearing, with a high near 82. Northwest wind 9 to 13 mph, with gusts as high as 24 mph. Just before 6AM this morning, the chicks were perched on the outer edge of the nest box overlooking the parking lot below. At 6:15AM the female arrived with food and the largest chick grabbed it and went to the far back left corner. A bit later, there was a tug of war over the food. Aside from food battles and feedings, they now spend their time wing flapping, and running around the nest box. While resting they will now perch at the outer edge of nest box. The last bits of down have still seen on their backs, but not much left. 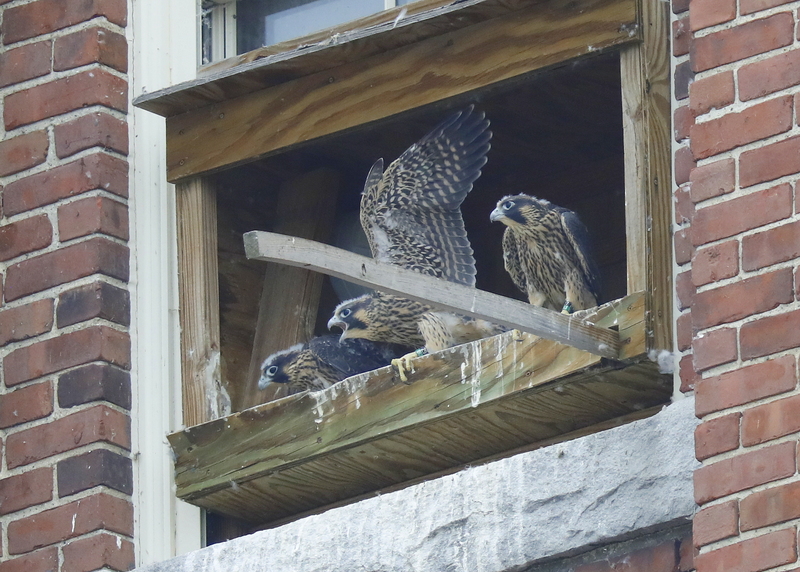 At day 37, aside from perhaps a tuft of down feathers also remaining on the crown, peregrine chicks are fully developed and ready to take flight. Their next major change in appearance will be around one year of age, when they begin to molt and acquire their adult plumage as their feathers are replaced. By now, the chicks are much more active and very restless, and they take advantage of whatever space the nest box has to offer. They will hold on for dear life as they flap wildly on the outer edge of the nest box. They will face outward as well as straddle the edge of the box. They are also estimating the distance to the nearby rooftop off to the right. This rooftop offers them a proximate landing pad after initial launch! 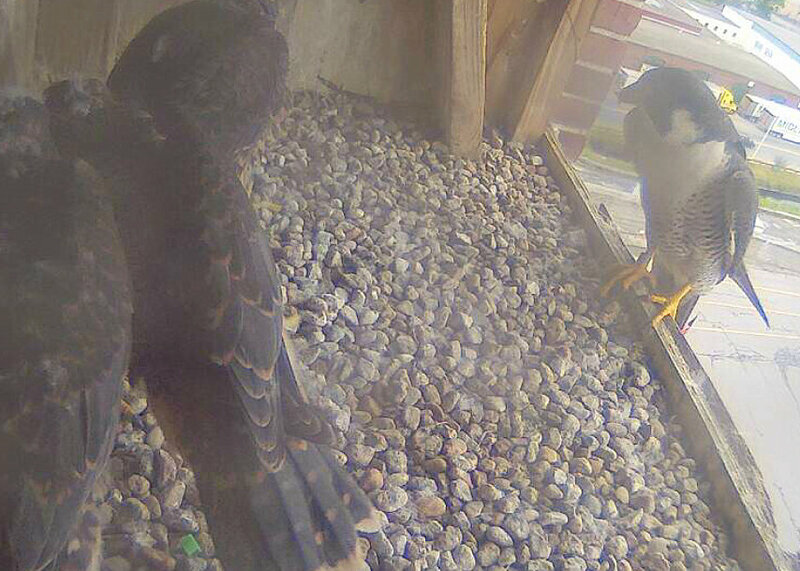 Lawrence Peregrines: view from outside! 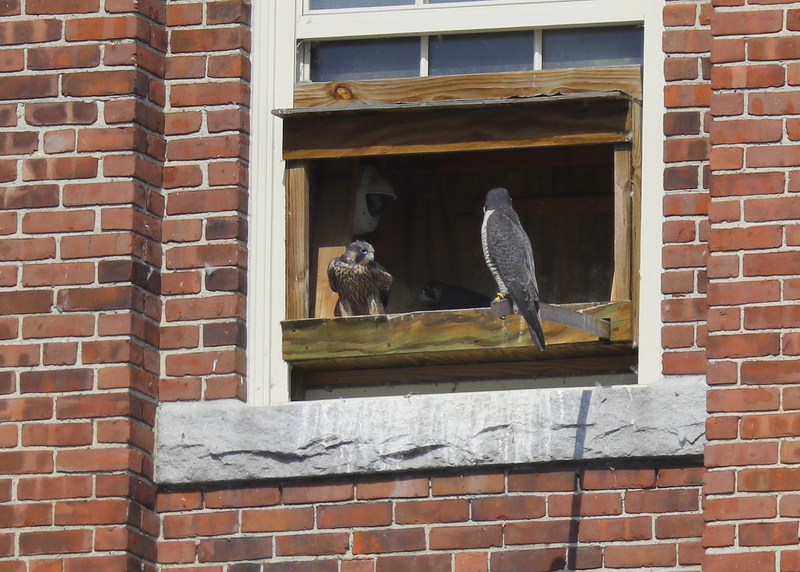 The peregrine chicks and adults were very active around the Ayer Mill Clock Tower late Monday afternoon. The chicks were moving around non-stop and wing flapping with added energy. The adults made a large number of aerial loops around the Clock Tower under mostly cloudy skies, winds from SW at 14MPH and gusts up to 21mPH, and temp at 89F! The adults seemed to be in a playful mode and made a number of mock combat moves, but never making contact. Finally, the female made a number of final loops and then landed on the outside perch pole and remained for a while! Day 36: more wing flapping! Sunrise this morning was at 5:06AM. The peregrines started of this morning under fair skies, winds from the south at 7MPH, and temp at 70F. The forecast for the day ahead calls for a slight chance of showers and thunderstorms after 3pm. Increasing clouds and hot, with a high near 98!! Heat index values as high as 101. Southwest wind 6 to 15 mph, with gusts as high as 28 mph. Chance of precipitation is 20%. And then there were two? 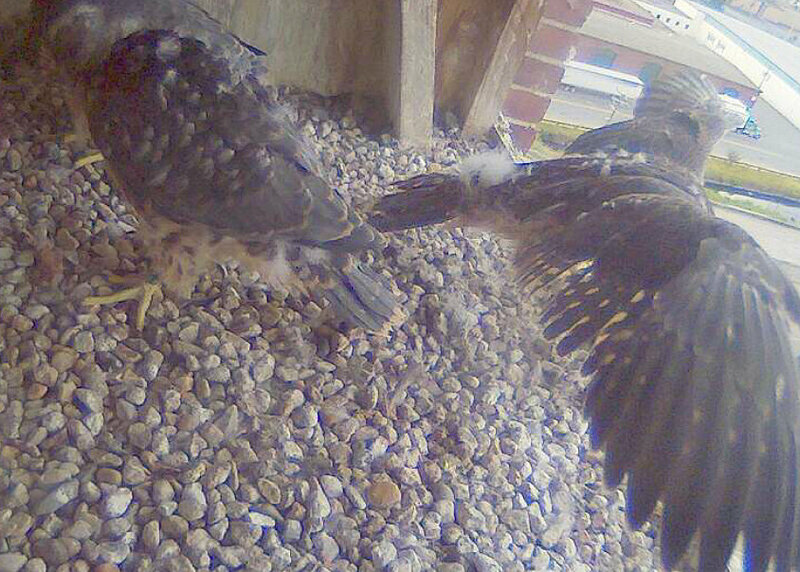 After the first watch this morning, it looked like only two chicks in the nest box!! The third one was hiding underneath the web cam. Looking back, at 28 days, or 4 weeks old, the young falcons really began to show their juvenile plumage, and became much more active around the nest box. They started much more active wing flapping, which helps to shed the down. At 35 days, or 5 weeks, they became well feathered and most of the down has been lost, though some adheres patchily to the young birds. The quill feathers are quite strongly developed, though the wings and tail are still short and rounded. At day 36, the chicks look almost like full-fledged juveniles. They are spending much of their day flapping their wings, which both strengthens their flight muscles and shakes loose some of the few remaining down feathers. In the midst of wing flapping frenzy, those remaining bits of down go airborne!